Living in Chicago has its perks. One of my favorites? An incredible number of restaurants. Last night I typed our address into Yelp and set a one mile search radius. Any guesses how many restaurants came up? One hundred forty-one restaurants, all within walking distance of our apartment! You can pretty much find anything you are craving: Thai, Italian, Indian, Chinese, Pizza, Greek, American, bar food, sushi, Philly Cheesesteaks, Vietnamese, French, Mexican, Russian, Filipino, Irish, German, Korean, Japanese…and more. A few of our favorites? Just up the street from us in an amazing Indian restaurant, Paprika, that we just love. The owner, Shah, is frequently our server and cooks all of the food himself. Just a short walk away in Lincoln Square there is a great French restaurant, Bistro Campagne. We always split the French Onion Soup and a salad, then get our own entrees, and share dessert. Okay, fine. Sometimes we get two desserts (don’t judge!). Their streak frites is my absolute favorite! The Vietnamese bakery up the street, Nhu Lan, serves up some of the best sandwiches I’ve ever had. They bake hundreds of loaves of fresh French inspired sandwich bread, or “banh mi,” daily. On average, I eat there at least once every other week (and sometimes more often, but who’s counting?). To make this wonderful dip you will need 2 medium eggplants, 2 tablespoons olive oil, 1 teaspoon kosher salt, 6 tablespoons tahini, 2 garlic cloves, 1 lemon, a pinch of cayenne pepper, a pinch of ground cumin, 2 tablespoons chopped fresh parsley, and 1 tablespoon toasted sesame seeds. Preheat your oven to 375 degrees. Prepare a baking sheet by brushing it with 1 tablespoon olive oil and sprinkling it with 1 teaspoon kosher salt. Wash your eggplants, then use a fork to poke several holes in each. Next you need to char the skin of your eggplants. This is easy to do if you have a gas stove. 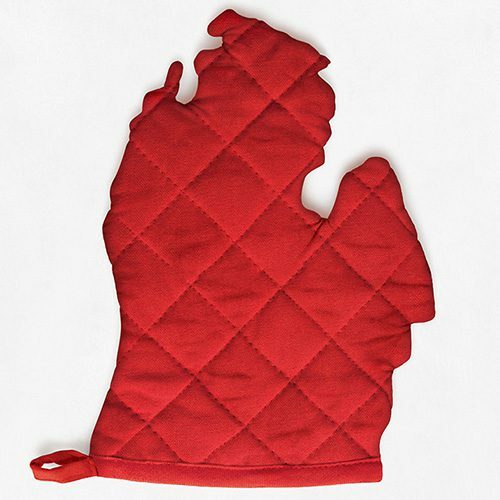 If you don’t have a gas stove, you can use your broiler or even a grill. 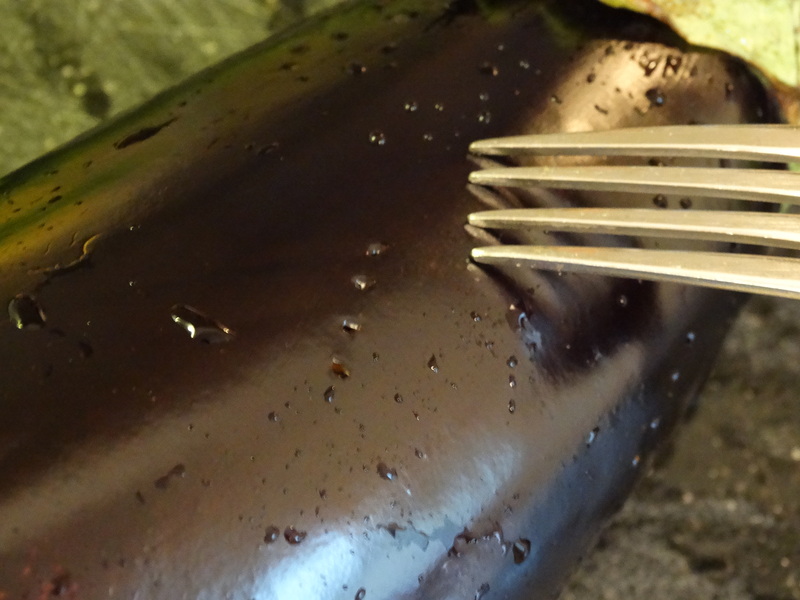 Use metal tongs to turn your eggplant over the flame, ensuring that it chars evenly. Once both eggplants are nicely charred and cool enough to work with, place them on a cutting board, cut off the stem end, then cut in half lengthwise. Place each half cut side down on the baking sheet and roast for 30 minutes, or until very tender. 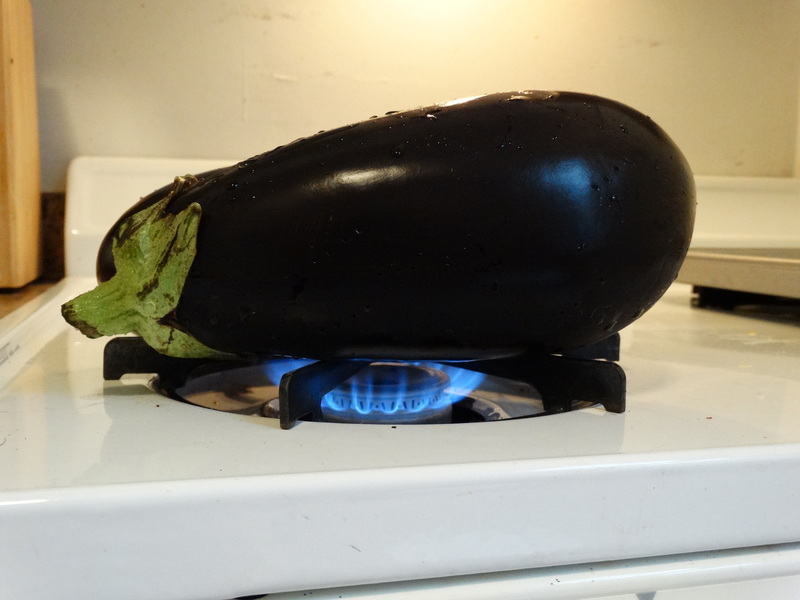 Let the eggplant cool to room temperature. While it is cooling, chop 2 tablespoons of fresh parsley, juice 1 lemon, and lightly toast 1 tablespoon sesame seeds over medium-high heat. 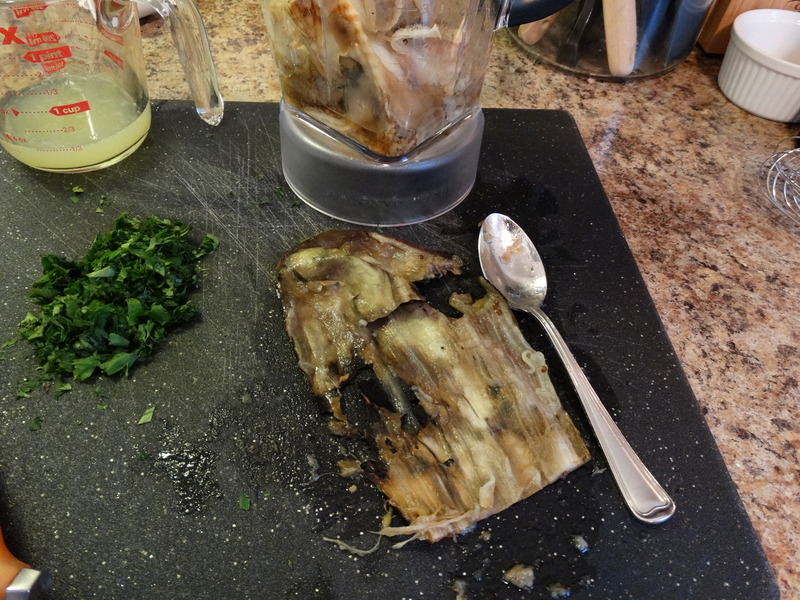 When your eggplant is cool, use a spoon to scrape the flesh from each skin into a blender. 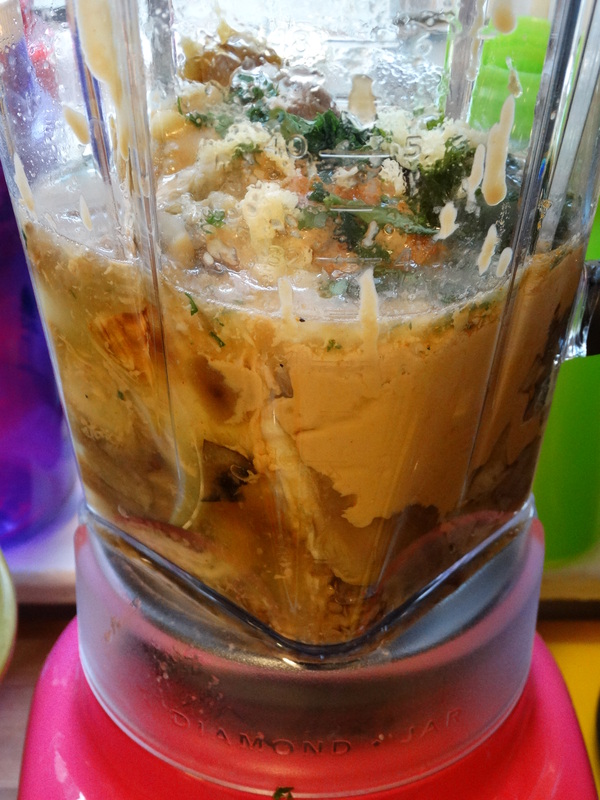 Also add the tahini, garlic cloves, lemon juice, cayenne pepper, cumin, and 1 tablespoon chopped fresh parsley to the blender. Pulse until combined, but still coarse in texture. Transfer your baba ghanoush to a serving bowl, topping it with the remaining tablespoon olive oil, tablespoon chopped fresh parsley, and tablespoon toasted sesame seeds. 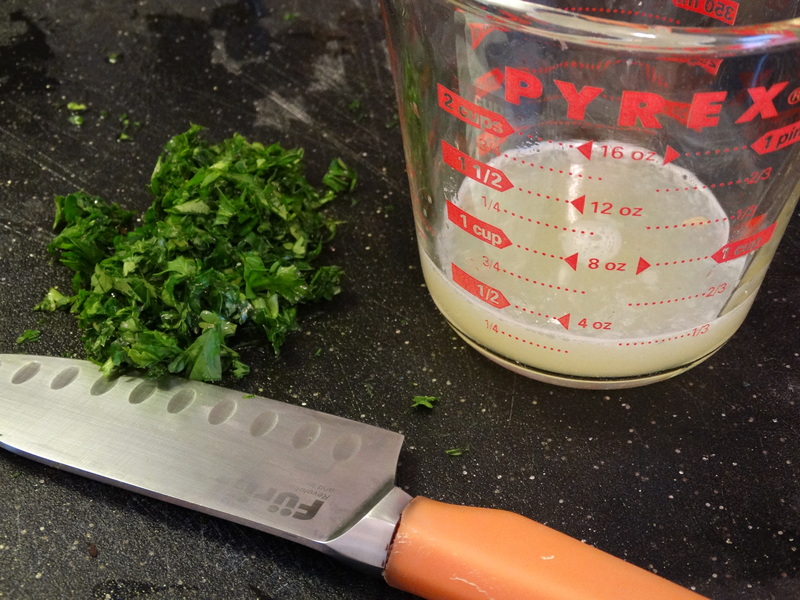 Serve with pita wedges or sliced fresh veggies, such as cucumber, carrots, and celery. Last but not least, ENJOY! 1) Preheat your oven to 375 degrees. 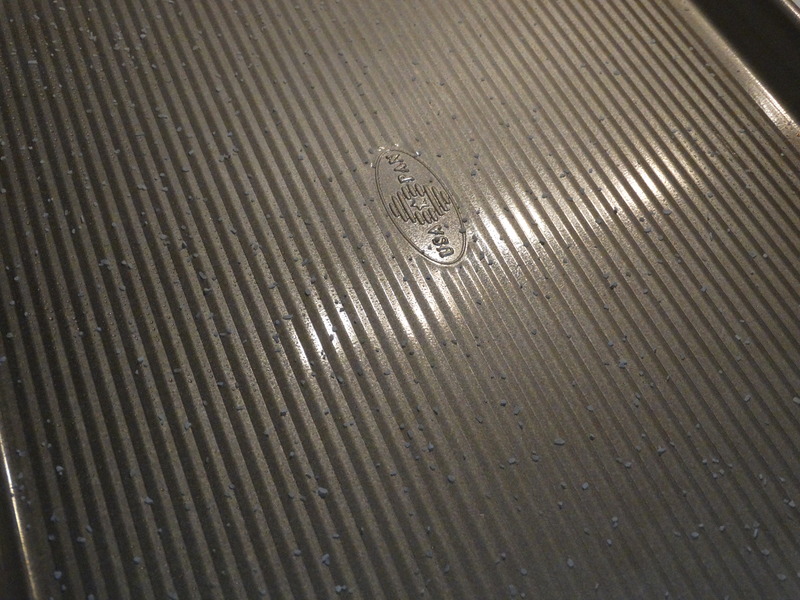 Prepare a baking sheet by brushing it with 1 tablespoon olive oil and sprinkling it with 1 teaspoon kosher salt. 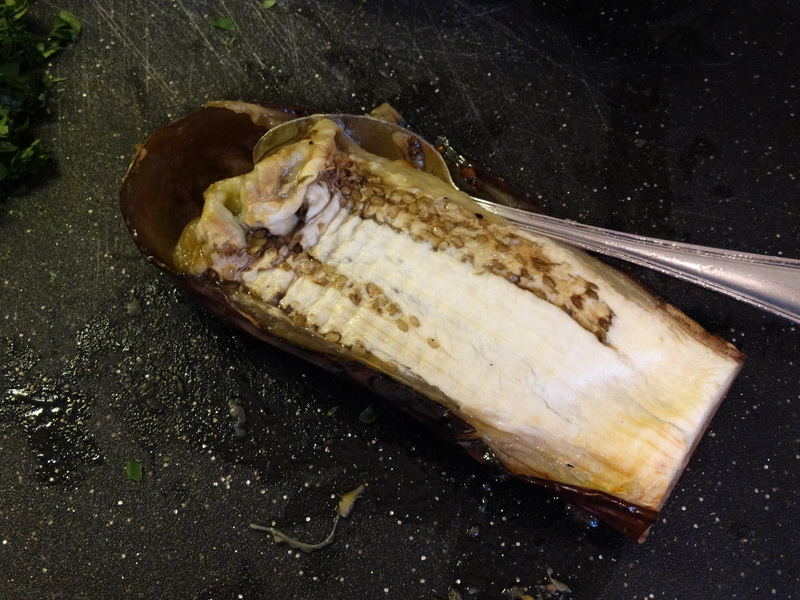 2) Char the eggplant skins over an open flame or in the broiler. 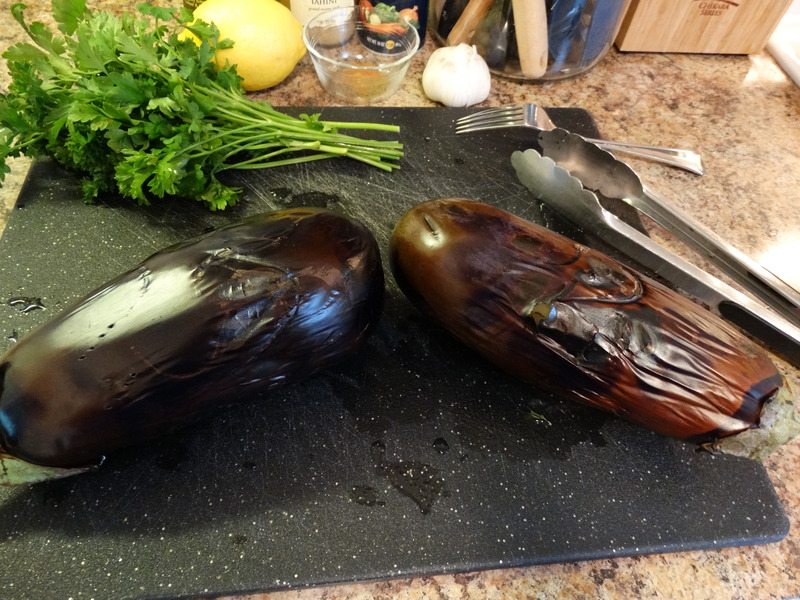 Once both eggplants are nicely charred and cool enough to work with, place them on a cutting board, cut off the stem end, and cut in half lengthwise. Place each half cut side down on the baking sheet and roast for 30 minutes, or until very tender. 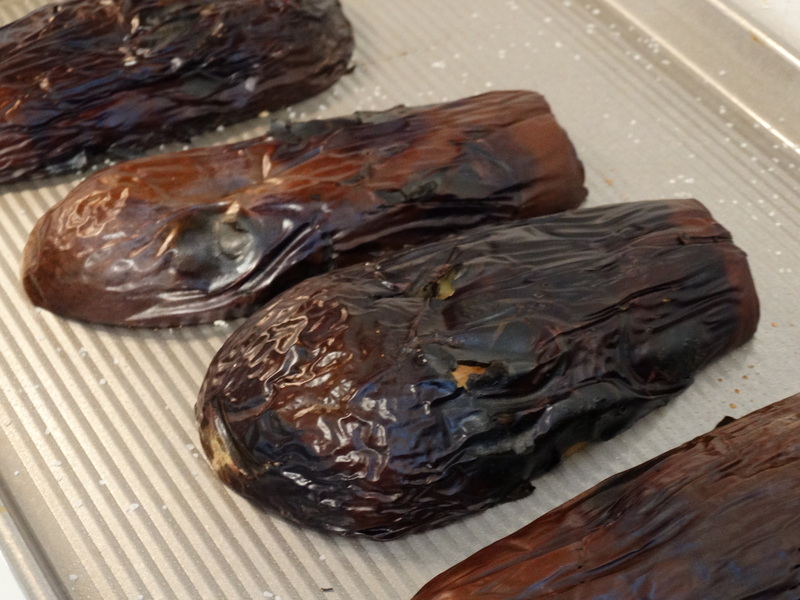 3) Let the eggplant cool to room temperature. While it is cooling, chop 2 tablespoons of fresh parsley, juice 1 lemon, and lightly toast 1 tablespoon sesame seeds over medium-high heat. 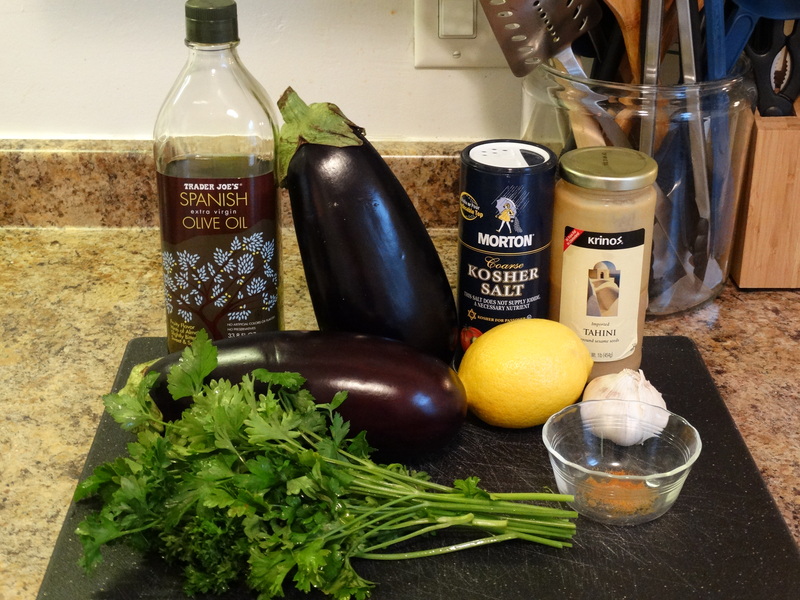 4) When your eggplant is cool, use a spoon to scrape the flesh from each skin into a blender along with the tahini, garlic cloves, lemon juice, cayenne pepper, cumin, and 1 tablespoon chopped fresh parsley to the blender. Pulse until combined, but still coarse in texture. 5) Transfer your baba ghanoush to a serving bowl, topping it with the remaining tablespoon olive oil, tablespoon chopped fresh parsley, and tablespoon toasted sesame seeds. 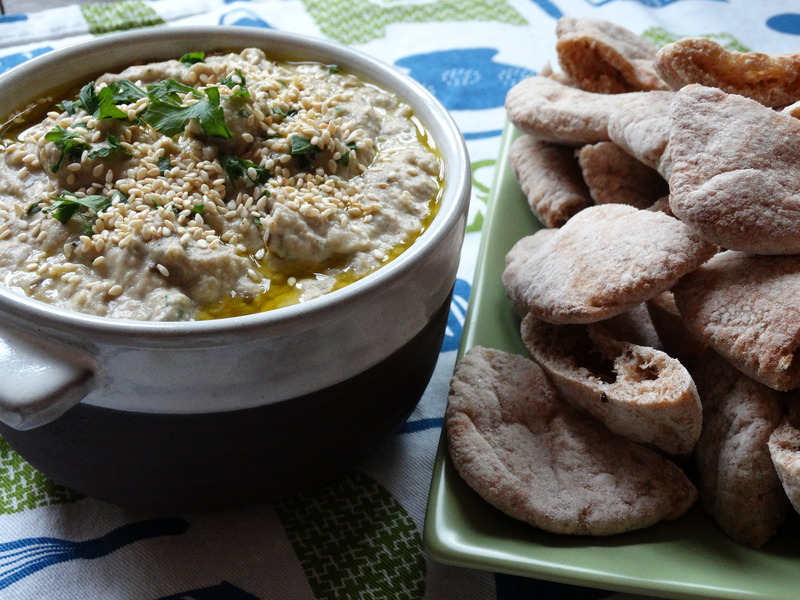 Serve it with your favorite chopped veggies and/or pita wedges and enjoy! Looks amazing! I usually buy it, but this recipe makes me want to try and make it at home!